We’ve all been there. Bounced around to different departments, put on hold, shifted from agent to agent, forced to repeat our mailing address or ticket number or describe the problem we’re desperately trying to get solved again and again across a multitude of different channels. Somehow, despite all the hype around machine learning, conversational interfaces, and personalization, the vast majority of customer experiences still leave us wondering if we’re trapped in a particularly torturous episode of Black Mirror. Live chat was supposed to save us from call center purgatory, but instead it just created another conversation silo – and a bad customer experience that can drive users away. And then the next generation of messaging technology came along. It was a huge leap forward because it eliminated the constraints of live chat for businesses and brought customers the rich conversational experiences they’ve come to know and love. But something is still missing from most customer support interactions: context. Understanding who the customers are, where they’re coming from, and what they’ve talked about (or bought from you) in the past is crucial for delivering personalized experiences that people have come to expect. Context can be tricky to maintain in a world of countless conversation channels, from chat apps and SMS to email and web chat — not to mention the growing legion of voice assistants. The good news is that all these conversations are a treasure trove of valuable context. The problem is that most businesses still don’t know what to do with it. Some photographs are so iconic, they define our conception of the people they depict. Einstein sticking out his tongue. Che Guevara wearing his beret. Audrey Hepburn and her cigarette holder. In my family, it’s a black-and-white photo of my late grandmother taken just before WWII. She’s young and pretty and apparently smiling at something just off camera. There are several copies in my family, but it wasn’t until I saw my 91-year-old grandfather’s original that the photo truly came into focus for me. In the photo on the right, scribbled on the back of it, in my grandmother’s handwriting, is a simple message from her to him. It’s just a few words written in Italian, but when I read the note it changed the way I think about my grandparents, about their relationship, about love, and my whole family history. It also made me realize that the context of a message (or in this case, an image) can be as important as the message itself. Most conversational technology today is focused on the surface of the conversation — what’s been said (the conversation history), where it was said (the channel) and how it was said (via text, image, video, emoji or some other fancy message type). But like body language, sometimes what hasn’t been said is just as crucial. 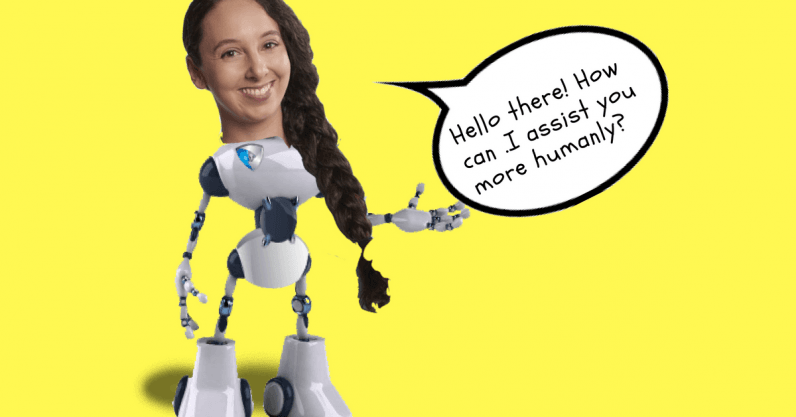 A typical chatbot, for example, is designed to process only what’s right in front of it, to ingest the message it receives, analyze its intent, and deliver the best available response or action. What it’s not equipped to do is take into account the context around the conversation. Is the human on the other end one step away from checking out with a loaded shopping cart? Did they recently complain about a negative customer experience? If the bot had access to that sort of information it could tailor its response accordingly, and even pass on the info to a human agent, CRM, or other piece of software to inform a future interaction. In this scenario, as the bot gets smarter (by truly listening to what the customer is telling it — both directly and indirectly), the business could make its user experience more relevant and earn the customer’s business, loyalty, and trust. That’s not just a process improvement. It’s a way to prevent customers from getting angry and finding another vendor. Brand loyalty is at an all-time low because shoppers know that they can easily find an alternative. That’s why savvy companies are looking for ways to delight and retain their existing users by making communications and support as seamless as possible. Although it’s easy to get distracted by the messaging app horse race or the latest advances in AI and natural language processing, what makes modern messaging so powerful isn’t the technology — it’s the people at the center of it. The next time you see a teenager immersed in her smartphone during a family meal, think about whether she’s being captivated by the quality of the user interface or Snapchat filter or by the immediacy and intimacy of the conversation. And if you picked up her phone and looked at her messages and Snaps would you be able to make sense of them without knowing the people she was interacting with and understanding the complexities of her relationships? Probably not. And that goes for all of us. As the humans responsible for building the customer experience of the future, we need to stop thinking about conversations as a stream of data and start focusing on the people at the center of those conversations. What makes those old-school customer experiences so frustrating is not that the company doesn’t already know who we are and why we’re calling. It’s that we feel like they should, either because we’ve already told them or because we know they already have all the information they need to figure it out… if only they cared enough to connect the dots. In a Medium post, Shane Mac, the CEO of chatbot platform Assist, looked at how people order a coffee. Mac explained that most bots are built with a tree-like structure, asking a set of pre-fab questions in a sequential order until they have the information they need to move forward. The problem is that this isn’t how people actually talk. In real life, we tend to order coffee through unstructured speech, where we just say what we want and get what we need. Sometimes we even change our minds and ask for almond milk instead of soy, or a small instead of a medium once we see how unreasonably big the cups are. The Starbucks barista app is actually pretty smart. It needs to fill at least two “slots” before processing an order — the “type” of coffee and the “size” — and will continue to ask questions until both slots are filled, no matter what sequence they’re filled in. Unfortunately, the bot only responds to the text typed into the app — it has no knowledge of the person on the other end of the line. What if, instead of just processing the order, the bot could store and track a user’s preferences over time? This more intelligent approach to slot filling would allow the business to interpret a command like “I’ll have the usual” and then make a judgment based on the time of day, location, weather and whatever other context it has access to. In my case, it’d learn quite quickly that at 8 am I have my latte, at 3:30 pm, when I need that extra kick I have an espresso, and on a hot summer day, when I’m out and about, I might opt for a nice cold brew. Is that too much to ask? That sort of personalization may seem futuristic but in many ways it’s a blast from the past, reflecting the way we’ve always interacted with our local barista, butcher or bank teller. Technology may be changing faster than ever, but people are still people. And as businesses and people who care about building a better customer experience for all, that’s one thing we can never lose sight of. Mike Gozzo is an engineer, strategist and serial entrepreneur. In 2014, he co-founded Smooch.io, where he currently serves as its head of product, transforming the way that thousands of businesses and millions of consumers communicate over messaging.